I've been using a custom Color Wheel on Visual Studio. When I read the post I saw there was a need to modify it to include Hex input. I asked Ego Eram Reputo,Red Ochre and Midora to have a look at it before posting and they had excellent suggestions which were incorporated into the control. Thank you all for taking time to look. It's a very nice control TR. Thank you for publishing it and for allowing me to make some suggestions. Download the zipped file in the post above. The zip contains three files: ColorWheelTR.cs, ColorWheelTR.designer.cs and ColorWheelTR.resx. Unzip them to a location you can find again. Copy the three unzipped files to your project folder. In the VS Solution Explorer, right click the project name and select Add Existing Item from the context sensitive menu. Navigate to the ColorWheelTR.cs file and double click it to add it to the project. Press F6 to build the control. In your projects design view (the UI view), open the Toolbox. You'll find ColorWheelTR at the top of the Toolbox. Drag the control to your UI just like any regular control. Click the control to highlight it. Find the field ValueChanged. 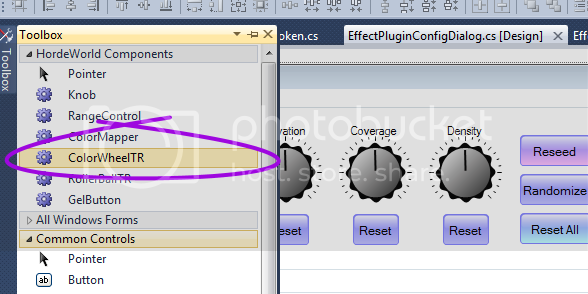 Double click in the empty space beside the field to create an event handler which fires when the control is changed. The appropriate code stub will also be created. This is where your code should grab and use the new color value. Thanks for the control TR! Many E.E.R for the very useful guide on how to use it - I'm bookmarking this page!